I’d love to take your Sumi-e Paining at Lillstreet-but I am a beginnner-so I am not sure I would be up to your class which says “advanced beginner.” What do you think? My Sumi-e class is perfect for beginners. 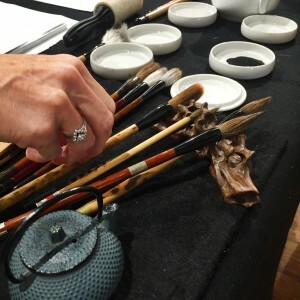 I will demonstrate sumi-e exercises and provide an overview of the process with hands on instruction for beginners. Returning students receive more advanced assignments and are encouraged to develop their own practice and style. The class environment is meditative and designed to build self awareness and confidence. Thank you so much for your questions, you helped me realize that this might be a concern. Are you interested in the One day Workshop or the 5 week class?